lol… i guess he doesn’t have any idea of who the middle guy is… oh, and ‘facepalm’! Well, seeing as how “middle guy” was pretty much gayer than a bag of dicks, I doubt that he was too concerned. That would be John Deacon, the bassist. I’m not 100% sure but I think it’s Jon Deacon, the bass player from Queen. BTW – does anyone know, were all the members of Queen gay? Or just Freddie? Actually Freddie was bisexual (he had a long term relationship with a woman, Mary Austin), but the others were straight. All the others are married, and with kids. The other guy i believe is Brian May from Queen. Just Freddie was gay. he is also a Zoroastrianisn. His real name was Farokh Bulsara. 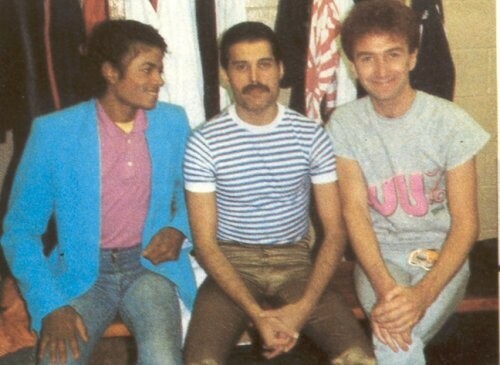 You are correct, that is John Deacon….